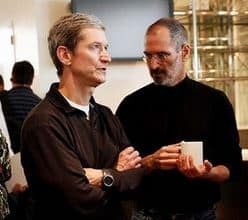 In the last days of his life while struggling with an aggressive form of pancreatic cancer, Steve Jobs learned that Tim Cook, who would eventually become Apple’s next CEO, was a potential blood match. That match meant that in theory Cook could have donated part of his liver to Jobs, which might have prolonged his life. And he doesn’t think about it. It was not, ‘Are you sure you want to do this?’ It was not, ‘I’ll think about it.’ It was not, ‘Oh, the condition I’m in . . .’ It was, ‘No, I’m not doing that!’ He kind of popped up in bed and said that. And this was during a time when things were just terrible. Steve only yelled at me four or five times during the 13 years I knew him, and this was one of them."